Diepenbrock was annoyed by the pro-German sympathies of people in his immediate neighbourhood, such as Willem Mengelberg. He wanted to oppose this by giving a performance in the Concertgebouw on 9 April 1916 of Debussy’s Berceuse héroïque (Heroic Berceuse), a work dedicated to the Belgian King Albert I containing a musical quote from the national anthem, the Brabançonne. However, the management of the Concertgebouw turned down this programme proposal (see RC 126). The fact that his war song Les poilus de l’Argonne (The Soldiers of the Argonne, RC 122) was performed in the Recital Hall may have been a form of compensation. On 26 May 1916, while Diepenbrock was staying in his cottage in the village of Laren, he composed Zegeklanken (Sounds of Victory) for carillon. According to Wouter Paap, he was “inspired by a victory report of the Allies”, which most likely concerned the recapture by the French of Fort Douaumont, near Verdun. 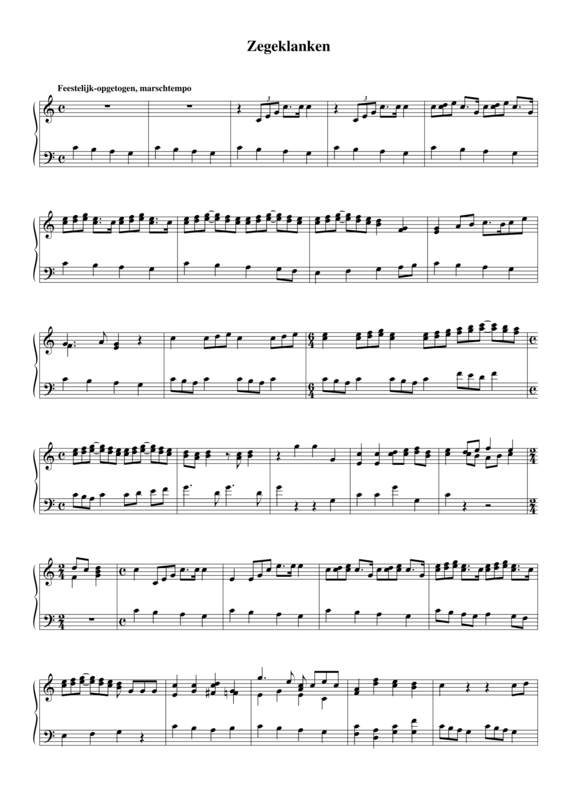 This fanfare-like work in a festive-jubilant march tempo is a potpourri of quotes from the Brabançonne (from the upbeat to m. 9), the Dutch national anthem, the Wilhelmus (from the upbeat to m. 16) and the French national anthem, the Marseillaise (halfway m. 23). The use of the descending tetrachord as an ostinato motive in the bass, can also be found in Diepenbrock’s Te Deum (RC 39) and his Landstormlied (Song of the Home Reserves, RC 123). The work was premiered by Jacob Vincent (1868-1953) on the carillon of the Royal Palace in Amsterdam on 18 June 1916. Correspondence suggests that he quite likely played an arrangement of the Landstormlied then as well. (BD IX:118) It is remarkable that this politically charged work, in which Diepenbrock literally shouts his pro-Belgian and pro-France sympathies from the rooftops, was executed in such a prominent place in the Netherlands at a time when so many people were afraid of openly taking a stance against Germany. 1 For information on the Fatherland Club see: Ismee Maria Tames, ‘Oorlog voor onze gedachten’. Oorlog, neutraliteit en identiteit in het Nederlandse publieke debat (Hilversum: Verloren 2006).